The bedroom is your refuge, your sanctuary. So it stands to reason that it should be as comfortable, personal and stylish a place as possible. Today's modern bedrooms are cozy, yet preferably clean and clutter-free. As such, contemporary bedroom furniture is designed with soft yet clean lines and with super-functional storage solutions that will keep everything in its place and conveniently at hand. With these bed frames, nightstands and clothing dressers, you'll quickly take your bedroom's look and feel to the next design level. While these pieces are necessary functional elements of a room, these furniture designs have the ability to bring out the character of the space. Begin your furniture design by selecting a new bed frame. These frames are designed with precision and quality in mind, and many feature eye-catching wooden accents. Here you will find platform beds, storage beds and unique options that stand out in any room. Pair your bed with a couple of nightstands and look to the assortment of clothing dressers for a good-looking way to keep clothes organized. Catch up on your favorite book with a cozy lounge chair and look to the selection of benches as accent pieces or a simply a place put your essentials. Modern bedroom furniture successfully finds its way into a number of bedroom styles ranging from those decorated with mid-century modern accents to colorful, vibrant rooms that really show off a personality. Stylish good wood looks are perfected in the assortment of bed frames from Copeland Furniture. 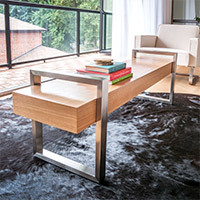 Or, if you prefer a sleek stainless steel look, you'll want to see the options from Calligaris. Calligaris also offers a variety of nightstands and dressers to complement your bed frame. 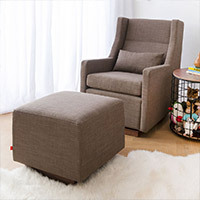 Blu Dot achieves the contemporary look of bedroom furniture and if it's a cozy lounge chair you need for relaxation or reading, be sure to see the selection from Gus Modern. Furnishing your space with stylish bedroom furniture found here is guaranteed to be a happily welcomed addition. When choosing any piece of furniture for your home, you need to be cognizant of its size. This is especially true with bed frames -- make sure you choose the appropriate sized frame for your bedroom and mattress. Nightstands and side tables are available in multiple sizes, some with the options for storage and some that are open and airy. Be sure to review important sizing dimensions like height, weight and width before selecting your new furniture. Finally, make sure you choose the furniture that is representative of your room and also accomplishes the functional task at hand. If you have any questions about the bedroom furniture featured here, please call our furniture experts at 877.445.4486. If you are going for a decidedly modern bedroom design, then you'll want to dress it up right with the soft and stylish selection of bedding. The bedding collection includes sheets, shams, pillows, throws and other linens that are vital to properly make the bed. And what is a well-designed bedroom without the proper lighting? Look to the assortment of bedroom lighting to find the right mix and match of ceiling lights, wall lights and portable lamps to successfully illuminate the room and shine a light on your furniture choices.